Also called the starry sky or the sky beetle, the Asian longhorn beetle is a species native to China, Korea and Japan. Over the last 20 years, this beetle has been spreading to North America and Europe, mostly through wood packaging material. Today, this beetle probably poses the greatest threat to date to traditional British and European broad-leaf trees. It was first discovered in Britain in 2012. The Food and Environmental Research Agency and the Forestry Commission are working together to find a way of eradicating it. How to Recognise Wood Infestation? 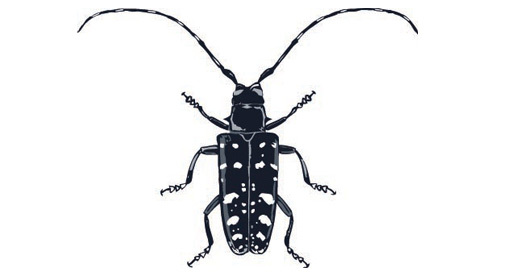 The presence of the Asian longhorn beetle can be recognised by piles of sawdust at the base of trees, scraped bark, bleeding sap and exit holes in the tree’s main trunk together with feeding damage caused in the bark of branches and shoots. The Pine Wood Nematode is a native species of the Unites States but also occurs in China, Japan and Portugal. This insect causes wilting in pines and was first recognised in the early 1900s in Japan. These pests will infest any wood packaging material that is made from raw and untreated timber. In addition, old wood packaging material is frequently repaired and re-used so the infested material may spread the insects over a large geographical area. The International Standards for Phytosanitary Measures No. 15 — or ISPM 15 — regulates all wood packaging material that is used in international trade. The standard was developed to tackle the global spread of wood infestation and to reduce the risks of introducing new pests through packaging timber products. The standards are implemented through the International Plant Protection Convention (IPPC), a treaty administered by the United Nations’ Food and Agriculture Organisation (FAO). The ISPM measures are also recognised by all members of the World Trade Organisation (WTO). The measures apply to hardwood and softwood timber packaging materials that are used for crating, pallets, dunnage, cases, skids and packing blocks, among others. The standards require the wood packaging material to be debarked and later heat-treated or fumigated. The wood will then be stamped as complying with the standards. Pallets made from ISPM 15 compliant wood are called ISPM 15 pallets or heat treated wooden pallets. All wood packaging that is manufactured in Britain and used for export must comply with ISPM15. British exporters also have to comply with any additional import regulations stipulated by any destination country. All 28 European Union member states are contracting parties to the IPPC treaty and therefore must comply with ISPM 15 standards. Extra care is necessary when exporting to Portugal, as that country has introduced emergency measures to counter the spread of the Pine Wood Nematode that has established itself there. British companies importing goods from outside of the EU or Switzerland must ensure that wood packaging material is ISPM 15 compliant. If any infested material enters the country, it has to be destroyed and cannot be re-used. Sometimes, however, this wood may be re-treated in specially approved wood treatment facilities, but it should also be re-marked.